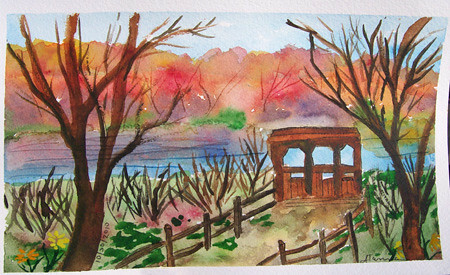 October Sketch Class Results – Let's Paint Nature! 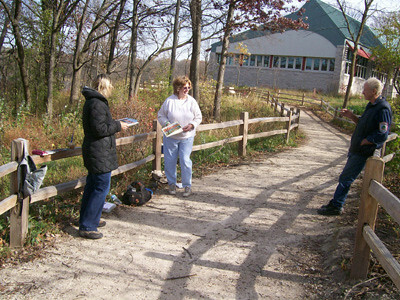 October 30th was another free sketch class at the Little Red Schoolhouse Nature Center. A short hike took us to the location the group decided to sketch. 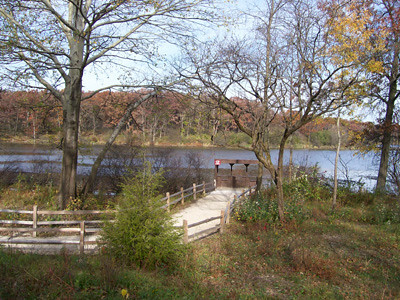 It is of an overlook on Long John Slough. This autumn morning we had a crisp temperature of 44°F, little wind, and full sun. Along our hike we accidentally startled a great blue heron who was resting along side of the slough. When we came too close, he flew inches above the water, with his graceful wings almost touching the surface, to another location along the water. When watching the great blue heron take flight, it’s as if time slows down and his wing beats are in slow motion. Just breath taking. We also spotted a group of Juncos. Juncos migrate to my area for the winter. I haven’t seen them since last winter, so I was very excited! 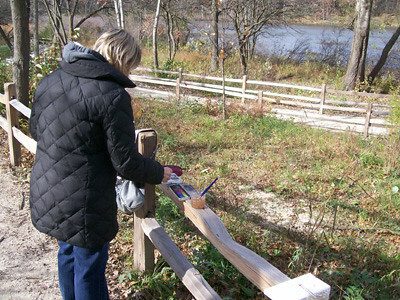 Student Michelle, gets to work on her sketch. The fence post makes a great support where we can rest our supplies. 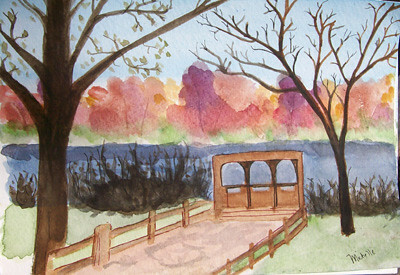 Student Alanna’s watercolor sketch is beautiful and captures the amazing autumnal colors and the crisp temperature of the morning. 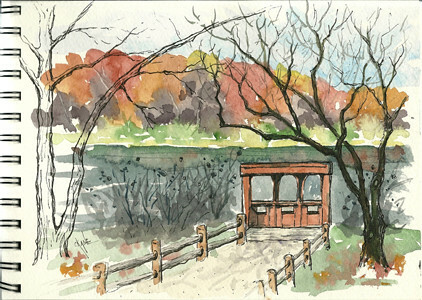 Student Michelle’s sketch also captures a beautiful crisp autumn morning in nature! Here is my sketch, I decided to add more detail at home with my micron pen. Even though autumn is here and gone in a blink of an eye, this sketch will hold me over during the freezing days of winter. I can gaze upon my watercolor and remember such a spectacular morning in the company of fellow nature loving enthusiasts, ready to learn. Our group grew when naturalist and artist Fred, stopped by to discuss nature and give us some artistic advice. If you would like to join us but do not want to paint, that’s OK! You can hike, learn about nature, and just watch the step-by-step sketching process. Maybe you would feel more comfortable to try it later in your own home. I also realised that sometimes life gets hectic and difficult and can zap the energy right out of you real quick, with damaging effects. In just the short three hours that our group was together, our internal batteries were recharged and our stress was left in the dust of the trails. Nature is therapeutic. And the sketch class is drug free therapy. Why not join us next month? Christine – You are sure right about these 3 hour sessions recharging our batteries! I felt so much low, dense energy before we began but as we walked and started to paint, by the noon I felt like my Inner Light was beaming!! Thank you for such a wonderful Saturday morning that carried me through the rest of the weekend. I look forward to the next one, but I was wondering, will the next one be the Saturday of the Thanksgiving Holiday – Nov 27 ? No matter when in November, I will be there!! Very cool. I remember one night, before I moved to NOLA, I stood on my favorite, secluded beach on a moonlit night, knowing it might be my last chance. I was delighted when a great blue heron flew by (low over the water, as you’ve said.) I’d never seen them fly at night before, but the moon made everything bright. Standing alone on the beach, I felt like that simple, beautiful show was JUST for me. When I miss my beach now, I just remember that moment and smile. Alanna: You’re welcome! It was very peaceful! Yes, the next one will be Sat. Nov 27th….we have to walk off our turkey bellies!!! ha ha ha! Can’t wait! Lana: WOW! What a great description! You are very luck to have witnessed that…I believe it was just for you too…a nice little treat! I never saw one fly at night, that would be neat.